Misaligned teeth negatively impact your confidence, often causing you to hide your smile. However, it also hurts your oral health as the teeth are more difficult to clean, which makes you more prone to gum disease and tooth decay. Although you have probably considered braces in the past, you do not want to feel insecure from visible metal wires and brackets. At DD Family Dentistry, we understand your concern, which is why we offer a more sophisticated treatment. 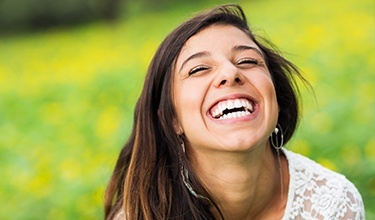 With Invisalign® in Carrollton, you will improve your self-esteem and dental health with a nearly invisible choice. 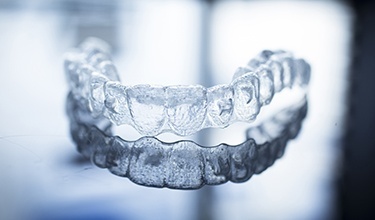 Invisalign® is an FDA-approved treatment that uses clear aligners to gradually align your teeth. There are no brackets or wires used so no one will be able to tell that you are undergoing an orthodontic treatment. 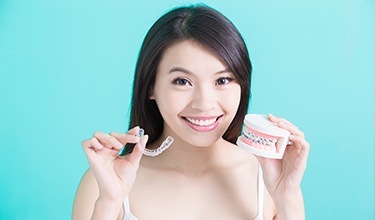 When compared to traditional braces in Carrollton, you benefit from a convenient and comfortable solution to align your teeth and your bite. 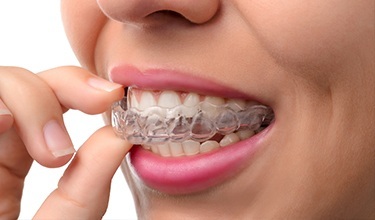 Invisalign® provides high-quality results when used to correct an array of bite and alignment issues. After determining that you are a candidate for the treatment, we use 3D scans of your teeth to create a series of aligners. 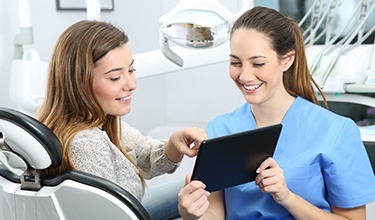 This technology allows us to move your teeth with precision while also showing you what your new smile will look like—even before you commit to the treatment. You will wear each aligner over your teeth for about two weeks. Since no wires are used, you do not need to have adjustment appointments. However, you will still need to come in every few weeks so we can monitor the progression of the treatment. You will wear each aligner for about 22 hours per day, only taking them out when eating, drinking, or caring for your teeth or the aligners. In about 12 months, you will have a straight, confident smile. To protect your results, you will briefly need a retainer to prevent your teeth from moving back into their previous positions. In addition to being virtually invisible, Invisalign® offers certain benefits that are not possible with other treatments. Since no wires or brackets are used, the aligners are comfortable so you do not have to worry about irritation to the inside of the lips or cheeks. The lack of wires makes caring for your teeth during the treatment easy. You do not have to brush or floss around brackets or wires. In addition, this also means there are no dietary restrictions. You can still enjoy your favorite foods because the aligners are removable. Start Your Journey Towards a Straight Smile Today! If you are tired of feeling insecure about your smile, it is time to see if Invisalign® is right for you with your dentist in Carrollton. At DD Family Dentistry, we will help you improve your confidence and oral health without wires or brackets. Contact our office today to schedule your consultation. We look forward to helping you restore your confidence.